Moises Alou did his part, hitting the ball down the line in Alou and the Marlins' first World Series game. Now it was time for his teammates to do their part. "We were all just trying to give it some English to make it stay fair," teammate Jeff Conine told The New York Times afterward. ''We went crazy. Everybody jumped up off the bench." The ball stayed fair, changing the game and sending the Marlins on their way to their first World Series win. But it was another post-season play, six years later, one with its own kind of English on it, that is the play Alou is most remembered for. That play didn't stay fair, or even in play in that game. But it did change the game. 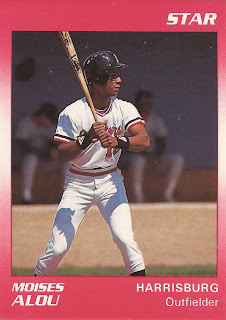 Alou's path to those games began back in 1986, taken by the Pirates in the first round of the January draft. The Pirates' selection of Alou him as the latest Alou to go into the pros, the most famous member of the family being his father Felipe Alou. Alou's stay in Pittsburgh, though, was brief, just two games. By mid-August, he was on his way to the Expos, the player to be named in a four-player deal. Alou finished out the year with 14 games in Montreal. He then lost all of 1991 to injury, rotator cuff surgery. He returned for 1992, making a run at the National League's Rookie of the Year with a .282 average and nine home runs. He came in second. In late September, he hit his first grand slam, a game-winner. But Alou did have his bad games, and his father and manager Felipe Alou let him know about it. "I told him I'm not happy with the way he was playing the outfield or swinging the bat," Felipe Alou told The Times in early August. "I told him he had to work hard to get back into what we think would be the ideal form for him." Alou hit .286 the next season, losing the last month to injury. In 1994, he hit .339. He also came in third place in the MVP balloting. In early June, Alou hit two home runs in a game. Three games later, he did it again. In July, he was an All Star. "The biggest factor this year is my attitude," Alou told The AP after that second two-home run performance. "Once I got injured last year, I developed an even stronger appreciation for the game." Alou stayed with the Expos through 1996, signing with the Marlins and winning the World Series in 1997. He moved on to the Astros for 1998, then lost all of 1999 to knee surgery. Alou arrived with the Cubs in 2002. It was in 2003, Game 6 of the National League Championship Series, that Alou's most memorable postseason play happened. With five outs standing between the Cubs and the World Series, Alou went over to the wall to for a foul ball. A fan got in the way. The ball dropped and the Cubs went on to lose. The play, including Alou's animated reaction, are now a part of Cubs lore. Alou continued playing into 2008, going through San Francisco and Flushing, before injuries finally ended his career after nearly 2,000 games played.